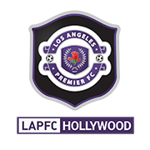 LAPFC Hollywood (formerly Hollywood FC) is a competitive soccer club developing serious players from all over the city. We are "FIFA-on-the-field," a richly diverse training community employing the newest USSF regimens to build players for college and beyond. Contact us for practice times and more info!